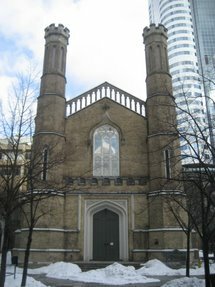 The Church of the Holy Trinity (Anglican) was established in October of 1847, built as a protest against private reserved pews that were rented for income in Toronto and most of England at the time (Whitla, p.1). The building was made possible by a £5,000 anonymous donation, later revealed to be from Mary Lambert Swale. She died at 25 years of age in England and left the donation in her will to build a church in the Diocese of Toronto with pews that would be "free and unappropriated forever" (Whitla, p.2). The terms of her donation were also that the church would be Gothic in style, cruciform in plan, and its altar and lectern were to be visible from all seats. Swale also donated communion silver and money for the font and the poor to the congregation (Whitla, p.3). The Tudor Gothic building was designed by architect Henry Bower Lane and built by John Harper who is also acredited with St. Michael's Cathedral. They used limestone from the Humber Valley and sandstone from Ohio for the building's foundation and tracery (Whitla, p.2). Reverend Dr. Henry Scadding was the Church's first Incumbent, who agreed to work for free for the first two years. He was also Master of Classics at Upper Canada College (Whitla, p.2). A1 - This is a grisaille window with quatrefoils and coloured borders. 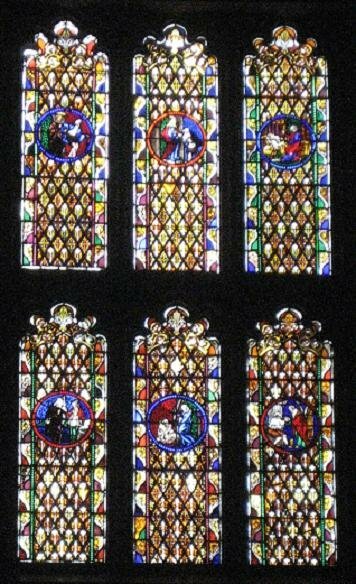 It was installed in 1868 by the McCausland Company and is an example of patterned and stenciled windows kept in stock of glaziers, which was far less expensive than commissioned glass. 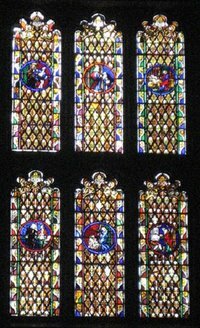 A2 - The Osler-Williamson window was donated as a memorial to Sir Edmund Osler's first wife, 2 children, and brother-in-law Alexander Williamson. The inscriptions offer counsel on death and read the following: "I heard a voice from heaven saying write blessed are the dead which die in the Lord./Blessed are the pure in heart for they shall see God./If this cup may not pass from me except I drink it Thy will be done./He shall carry the lambs in His bosom." 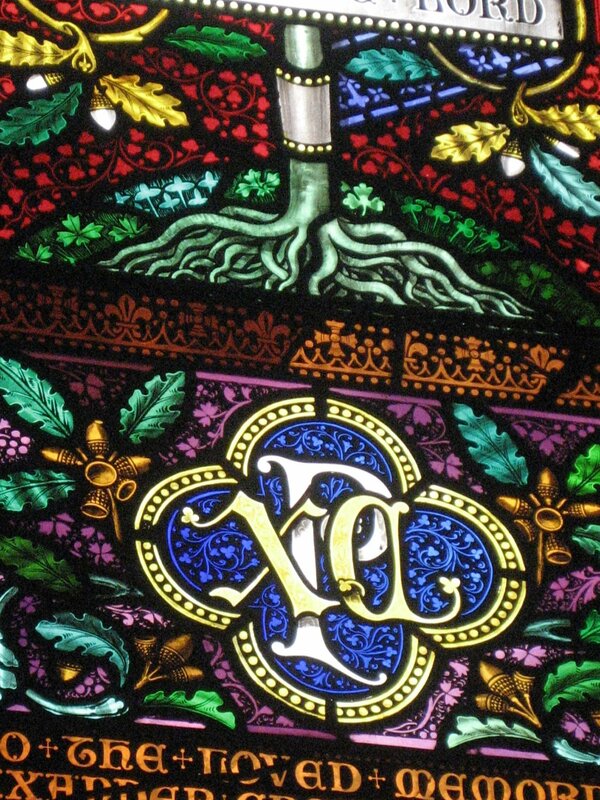 Each section of the window contains an emblem, including the Chi-Rho, Alpha and Omega, and oak trees with scrolls. The window's design is modelled after the work of William Morris in Victorian England, with its flat and easily legible stylized Medieval motifs. A3 - The Langmuir Window is a memorial to the Langmuir family, specifically Lieutenant Gavin Langmuir who died at Ypres in 1915 at the age of 23. It depicts St. Michael appearing to St. Joan of Arc with the laurel wreath of victory and Jesus preaching as a memorial to Langmuir's father. Shown at the very top is the family crest of a cap and greyhound. A4 - The War Memorial Window was done by McCausland in 1922 and was dedicated to a list of 32 names who gave their lives in the Great War. The lower panels depict 2 disciples on the road to Emmaus where they met a stranger who revealed himself to be the resurrected Christ. The upper panels show the Crucifixion with the Virgin Mary, John, and Mary Magdalene. The window's inscription reads: "I, if I be lifted up will draw all men unto me/Because I live ye shall live also/Be thou faithful unto death and I will give thee a crown of gold." This window employs Tiffany-esque techniques with darker, richer colours and opalescent shading effects visible in the sky. 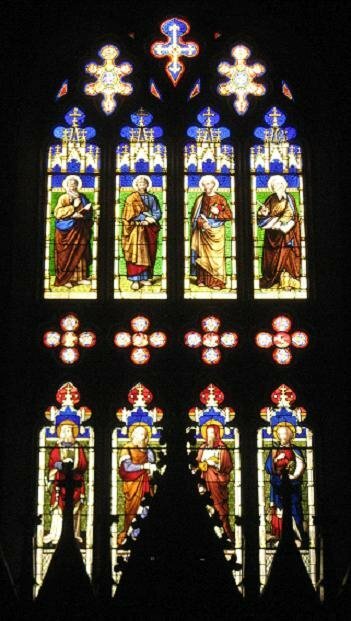 A5 - The North Transept window is another example of an 1870 McCausland grisaille window with a lozenge pattern and coloured borders. A6 - The Chancel window sits behind the altar of the Church. 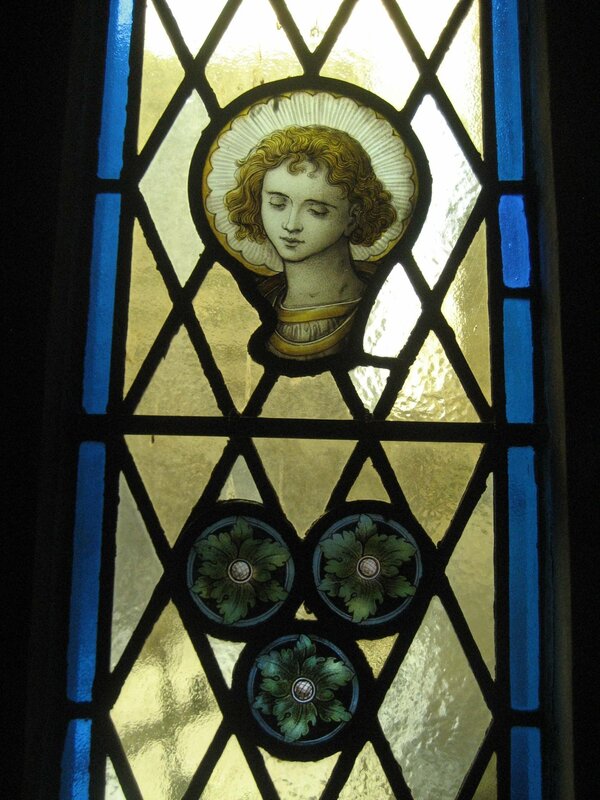 The upper lights of this window date to 1858 by Ballantyne & Allen of Edinburgh, Scotland. The four Evangelists Matthew, Mark, Luke, and John are depicted with their traditional symbols of the angel, lion, ox, and eagle depicted below in quatrefoils (Mattie, p.4). The lower lights date to 1858 by McCausland. The window marks the first use of figural motifs in Toronto stained glass, with traditional architectural canopies. The prophets who foretold of Christ's coming are depicted: Isaiah, Jeremiah, Ezekiel, and Daniel (Mattie, p.4). The inscription is from Revelation and reads: "Holy, Holy, Holy Lord God Almighty." It is meant to remind us of the Divine, made manifest in the Eucharist. A7 - The South Transept Mondelet Window was dedicated in 1880 as a memorial to Mary Letitia Mondelet and her son. It shows Jesus blessing the children and is appropriately located near the Church's baptismal font. The angel holds a scroll that reads: "Those that seek me early shall find me." The bottom panel is an 1870 McCausland grisaille that depicts the Victorian love of ornament with psuedo-Medieval motifs and heraldic fleur-de-lys and crowns. On May 9, 1977, a fire began in the Eaton's warehouses, then adjacent to the north and west ends of the Church. Holy Trinity lost its roof and 3/4 of its south side, including 3 nave windows. There is no documentation of the lost windows, though it is suspected they were by the McCausland studio. Later that day, a Sunday, parishioners gathered to worhsip outside and decided that Holy Trinity should remain standing on its original ground (Whitla, p.16). Thus, rebuilding began and the ceiling was painted blue as a reminder of the fire and the sky that acted as the ceiling in that first gathering of worship after the fire. 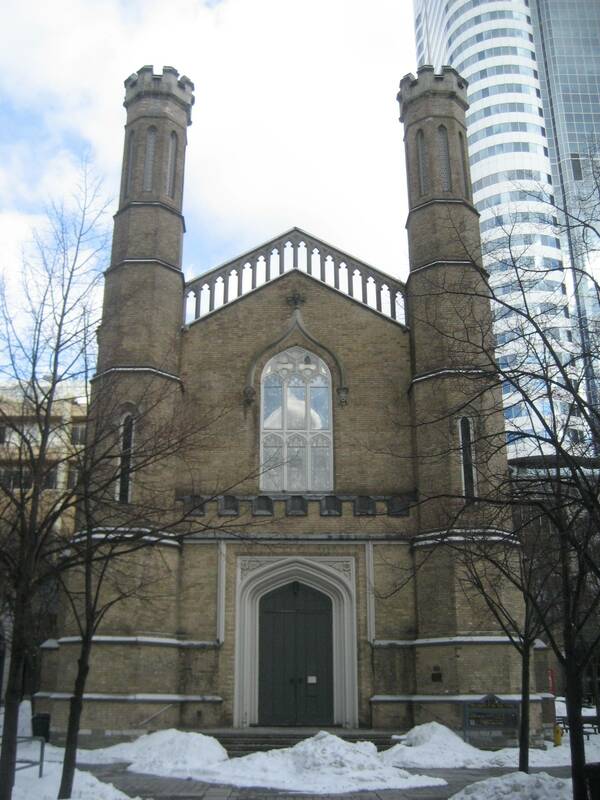 The parishioners occupied Cadillac Fairview offices that owned the Eaton's warhouses and were successful in obtaining a large settlement to rebuild the Church (Bob Smyth, in conversation 1 Mar. 2008). 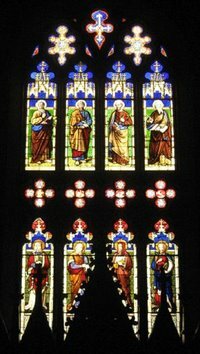 In 1979, stained glass artist Stephen Bélanger-Taylor was approached by Reverend Maxted, whose committee had commissioned 3 windows from him. They were to represent the Holy Trinity of God the Father, Son, and Holy Ghost. Following Belanger-Taylor's design, he was asked to present his plans to the entire congregation, describing all the symbolism and how it was used. The congregation then voted on each symbol and its interpretation in each window. Ultimately, the designs were approved. However, funding unexpectedly fell through (Bélanger-Taylor, Email to Anita Sott, 15 Feb 2008). 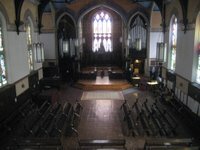 By the time Bélanger-Taylor had completed another commission for The Church of the Messiah, funding had returned to Holy Trinity. The artist installed the 3 windows with his assistant Pattie Walker. His wife, Denise Bélanger-Taylor, contributed some made to order glass. 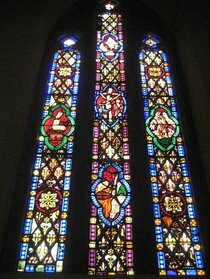 The final window, Gifts from God, was commissioned and installed in 1982 (Bélanger-Taylor, Email to Anita Sott, 15 Feb 2008). The windows are meant to be read from right to left when facing the South Nave wall. A blue line travels horizontally through the middle of all 4 windows, uniting them as a symbol of the Baptismal River, with Divine elements depicted above it and more earthly elements below. At the bottom, green and brown lines represent the foundation of life and growth in the world (Bélanger-Taylor, Email to Anita Sott, 15 Feb 2008). A11 - God the Holy Spirit is symbolized by fire. 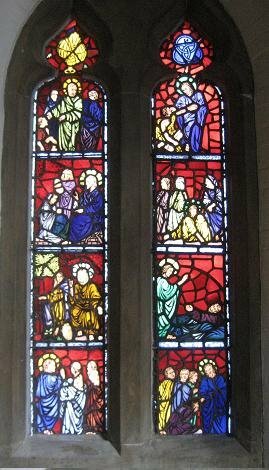 This window tells the story of the Pentecost, where the Holy Spirit descended on the apostles in tongues of fire, blessing them and calling them to spread the faith. The sun, moon, and stars appear to symbolize the cosmos (Allen). A10 - God the Creator is represented by the yellow triangle, in turn representing the Holy Trinity. The blue, yellow, and purple olours represent royalty of the Divinity of God. The blue oval is a "body halo" that encircles Christ in many Medieval images. IT is shown symbolically empty, meaning God can not be fully comprehended in one image. Eucharistic grapes, bread, and blades of wheat symbolize the body and blood of Christ and His goodness to mankind through bountiful harvest (Allen). 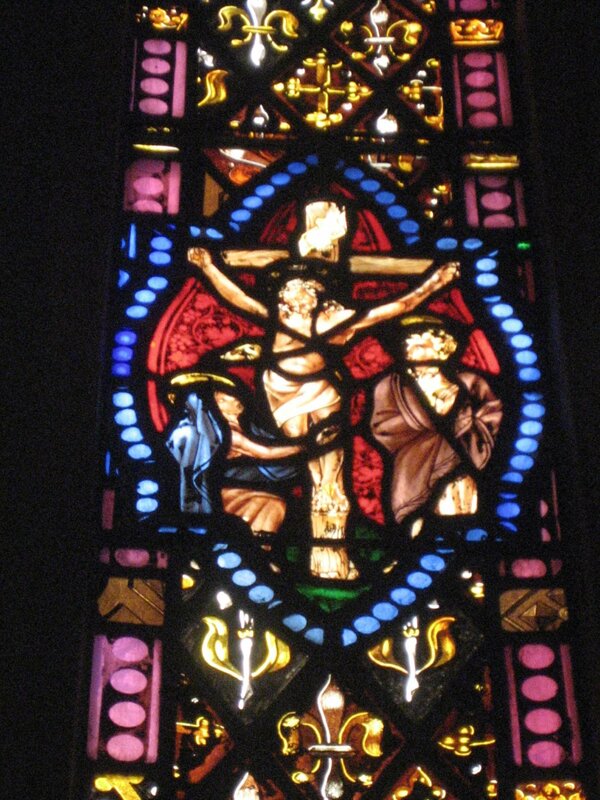 A9 - God the Son is represented by the instruments of His Passion - the cross and crown of thorns. The tree beneath refers to ancient beliefs that the wood of the cross came from the Tree of Knowledge of Good and Evil and is meant to represent all the branches of Christianity symbolically uniting at the trunk, rooted in their belief in Jesus. The dead wood of the cross is juxtaposed with the fertility of the tree (Allen). A8 - Gifts from God depicts the twelve gifts. Flowers are included to symbolize fertility, while the dove with the olive branch symbolizes peace. The pomegranate seeds symbolize the bounty of food and talents God bestows upon us. The green and brown tones are associated with fertility of the earth, while the blues and yellows call to images of the sky and heavens (Allen). A12 - The West Gallery Window was designed by William Bullock and done by McCausland in 1858. The Church archivist, Bob Smyth, noted Holy Trinity's annual production of the biblical version of the Nativity story (Bob Smyth, in conversation 1 Mar. 2008). This tradition was started by Patricia Frank in 1937, who was the daughter of the Rector of St. Martin's-in-the-Fields in Trafalgar Square, London (Whitla, p.8). She came to Holy Trinity with her husband John Frank, who was educated at Trinity College but went on to a curacy at the London church where he met Patricia (Whitla, p.7). John Frank is credited with initiating social programming in the Church including soup-kitchens for the hungry and turning the Church into a hostel for the unemployed who were travelling through Toronto including migrant tobacco workers on the Ottawa trek and as a leave hostel during WWII (Whitla, p.8). Frank also established the Social Action Committee that considered the role of the Church in the inner city to make a fairer and just society (Whitla, p.9). 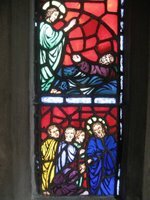 The window has grisaille quarries and depicts the Six Works of Mercy described in the Gospel of Matthew, Chapter 25. In clockwise order from left they read: Clothing the Naked, Taking in Strangers, and Visiting the Sick in the upper panels. In the lower panels are Giving Drink to the Thirsty, Feeding the Hungry, and Visiting Those in Prison. 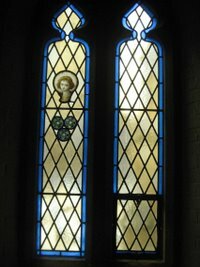 This window is representative of Holy Trinity's devotion to philanthropy since the time of its establishment; from the original free, unrented pews to the Church's ongoing committment to communtiy development. This include supplying a Hospice, a community centre on Church St., transitional housing for the displaced, the city's first gay and lesbian dances, accepting the homeless throughout the day, and instituting Toronto's first school for girls. 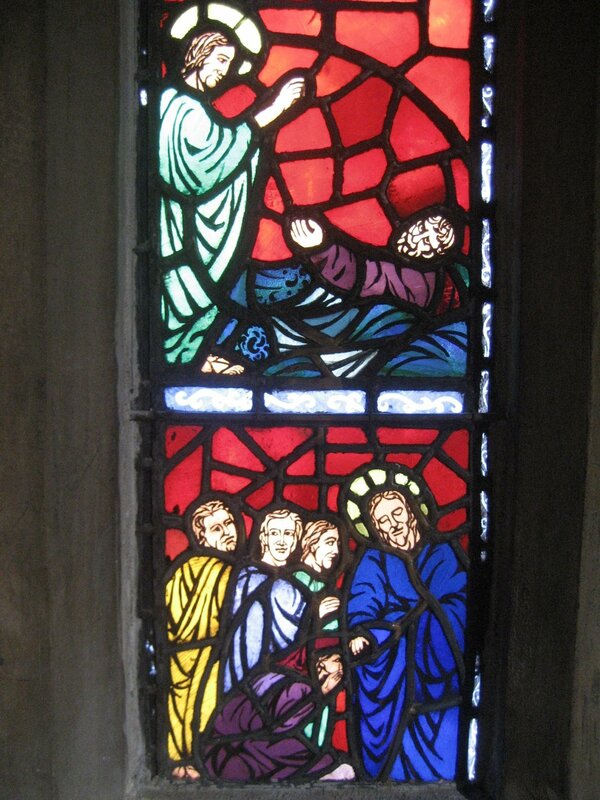 The window acts as a permanent reminder of Holy Trinity's mandate (Bob Smyth, in conversation 1 Mar. 2008). 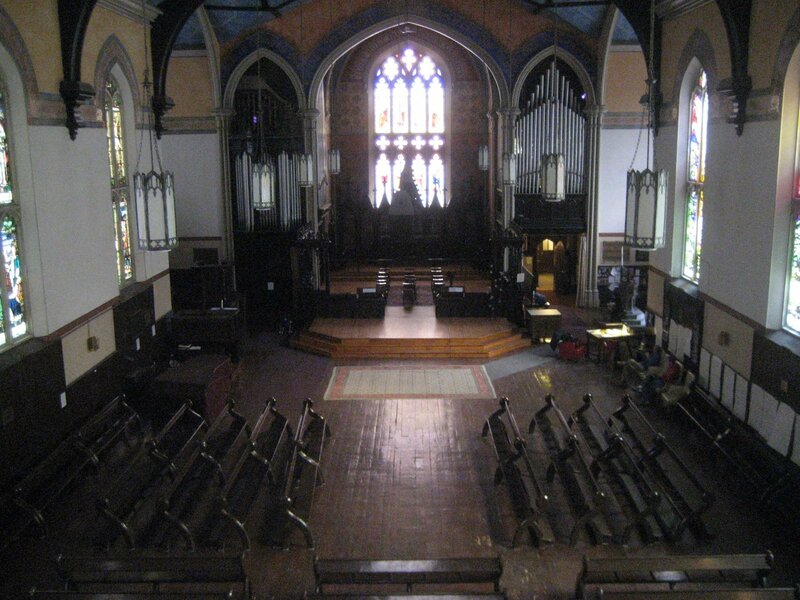 Holy Trinity's Chapel on the upper floor began as Toronto's first school for girls, designed by William Hay in 1858 before the province had announced the Ontario Education Act for public schools. William Hay also designed the two buildings at the rear of the Church which acted as the home of the Church's first Incumbent, Rev. Dr. Henry Scadding, and the Rectory which now houses the parish offices and various charities (Bob Smyth, in conversation 1 Mar. 2008). C1 - This window was also designed by William Bullock in 1858 and done by McCausland. 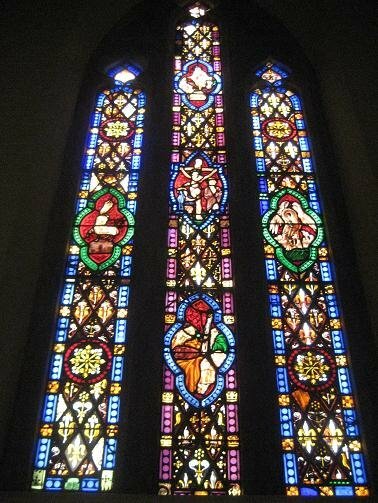 It is the first Toronto-made stained glass window (Mattie, p.4). It depicts the Nativity, the Crucifixion, and the Resurrection in the central medallions running vertically. On either side are the Paschal Lamb and the Pelican of Piety. 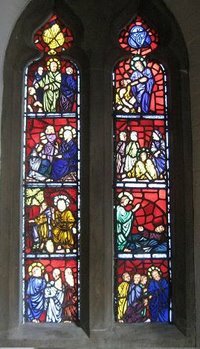 C2 - This window shows scenes from Jesus' life including his miracles and teaching, with very intricate patterning visible in the red glass. C3 - This window includes rescued glass from St.Martin's-in-the-Fields in London, which was destroyed during the 1940 London bombing. It is meant to symbolize the close connection between the churches and Holy Trinity's history with John and Patricia Frank (Smyth et al). The use of silver stain technique in evident in the portrait. There is no information available concerning the identity of the figure portrayed. All iconographical information about the stained glass windows was taken from the Didactic Window Descriptions, on site at The Church of the Holy Trinity, unless otherwise noted. Allen, Douglas. "Symbolism in the Contemporary Stained Glass Windows." Church of the Holy Trinity. Bélanger-Taylor, Stephen. Email to Anita Sott. 15 Feb. 2008. Didactic Window Descriptions (on site). The Church of the Holy Trinity. Toronto: 1 Mar. 2008. Mattie, Joan. The Stained Glass of Robert McCausland Ltd. Ottawa: Canadian Parks Services, 1991. Smyth, Bob. In conversation with Anita Sott. 1 Mar. 2008. Smyth, Bob et al. Information Brochure: The Stained Glass Windows at the Church of the Holy Trinity. Whitla, William. The Church of the Holy Trinity: A Brief History. Toronto: Holy Trinity Press, 2000. Holy Trinity's windows are numbered A1-A12, representing the windows of the Nave, Transepts, Chancel, and Gallery. The windows numbered C1-C3 indicate those in the Church's Chapel, originally Toronto's first school for girls, built in 1858 by William Hay. Webpage by Anita Sott. Photos by Anita Sott and Lauren Cheong. April 7, 2008.